This book provides the first systematic comparative analysis of climate security discourses. It analyses the securitisation of climate change in four different countries: USA, Germany, Turkey, and Mexico. The empirical analysis traces how specific climate-security discourses have become dominant, which actors have driven this process, what political consequences this has had and what role the broader context has played in enabling these specific securitisations. In doing so, the book outlines a new and systematic theoretical framework that distinguishes between different referent objects of securitisation (territorial, individual and planetary) and between a security and risk dimension. It thereby clarifies the ever-increasing literature on different forms of securitisation and the relationship between security, risk and politics. 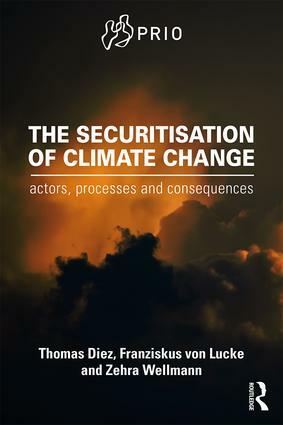 Whereas securitisation studies have traditionally focused on either a single country case study or a global overview, consequently failing to reconstruct detailed securitisation dynamics, this is the first book to provide a systematic comparative analysis of climate security discourses in four countries and thus closes an empirical gap in the present literature. In addition, this comparative framework allows the drawing of conclusions about the conditions for and consequences of successful securitisation based on empirical and comparative analysis rather than theoretical debate only. This book will of interest to students of climate change, environmental studies, critical security, global governance, and IR in general. 5 Mexico: A case of politicised securitisation? 6 Turkey: no climate for change? Thomas Diez is Professor of Political Science and International Relations at the University of Tübingen, Germany. He is author/editor of numerous books, including, most recently, A Different Kind of Power? The EU’s Role in International Politics (2014). Franziskus von Lucke is Researcher in the Department of Political Science at the University of Tübingen, Germany. Zehra Wellmann is Researcher in the Department of Political Science at the University of Tübingen, Germany. The aim of this book series is to gather state-of-the-art theoretical reflection and empirical research into a core set of volumes that respond vigorously and dynamically to new challenges to security studies scholarship. This series is now being published under the title Routledge New Security Studies.